One of the keys to success in the field of investing is to expose yourself to as many ideas as possible. Since good investment ideas are rare, investors often must examine dozens of companies before finding even one that is remotely interesting. The best way to learn about a company is to read Securities and Exchange filings, but there is a limit to how many 10-K reports an investor can review in a reasonable timeframe. Many investors use stock screening software to narrow down the field of investment candidates, but many screening tools are simplistic and can disqualify companies that may otherwise be of interest. Value Line Investment Survey is one of the best ways to gain exposure to a large number of companies in an efficient manner. Value Line provides stock screening tools but the strength of the service is in the information packed one page company reports. The primary limitation of Value Line involves the service’s proprietary “timeliness” rankings which are based on technical analysis and serve mainly as a distraction for the reader. While Value Line’s claims regarding the performance of the “timeliness” rankings may be accurate, high turnover investing based on technical factors is not an approach that a true value investor would use. 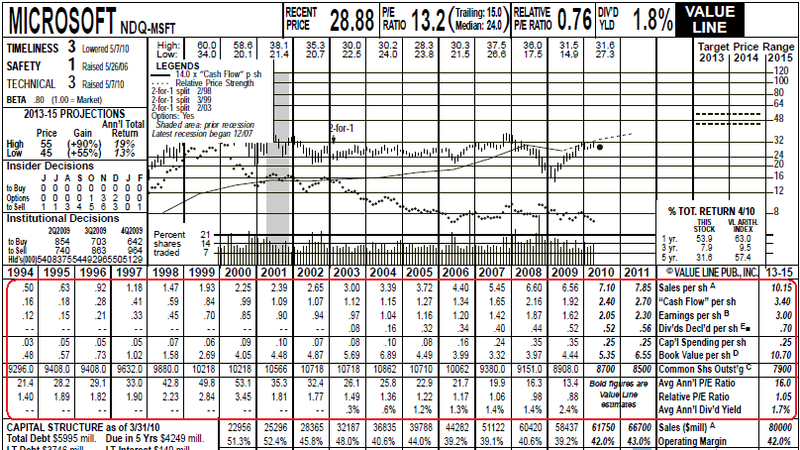 For value investors, Value Line’s real utility is in the excellent presentation of data on the one page summary. Within five minutes, most readers can determine whether a greater time investment is warranted for the company in question. This article provides some guidelines for value investors who are interested in using Value Line as a tool for quickly learning about a large number of companies. Each week, Value Line releases reports on approximately 130 companies. While the service is not inexpensive, many libraries offer hard copies of the service and a growing number of libraries also offer free online access. Value Line offers the Dow Jones Industrial Average company reports free of charge. We will use the report for Microsoft Corporation (pdf) dated May 21, 2010 for this example. Although most readers are already familiar with Microsoft, we will examine this report in an order that assumes the reader has no familiarity with the company and would like to quickly determine whether the company warrants further consideration. Do you understand the basic business and industry in which the company operates and is it within your circle of competence to evaluate? Do you recognize the names of any of the major holders of the stock? Sometimes well known value investors appear as the largest shareholder. Do the managers and directors have significant ownership interests? High insider ownership can often be a positive sign, particularly when dealing with smaller firms. How large is the company in terms of market capitalization? Are you comfortable with the debt position relative to the overall capital structure? Is the yearly debt service well covered by earnings? Many investors steer clear of companies with high levels of debt as a percentage of total capital. In the case of Microsoft, we are looking at a large software company with a $253 billion market capitalization employing modest levels of debt with officers and directors owning a significant percentage of the company. Does the company appear to have a history of worthwhile operating and net margins? Is there a discernible trend in the direction of margins over time, either positive or negative? How do the company’s margins compare to industry averages? Does the company have a worthwhile return on equity, taking into account the overall level of debt employed? In Microsoft’s case, we can see that margins have decreased from very high levels a decade ago but are still at very satisfactory levels. Return on equity is very high, although very significant share repurchases in recent years have placed an upward bias on return on equity. Is there any discernible trend in earnings and cash flow on a per share basis over the last several years? Is the company returning cash to shareholders in the form of dividends or share repurchases? Dividends is a line item and the share count is also available in the report. Does the company appear to be consuming a large proportion of cash flow for capital expenditures? Is there any trend in the percentage of cash flow devoted to capital expenditures over the past several years? The P/E Ratio is provided on an “average” basis for each year and is a crude indication of how much investors have been willing to pay for one dollar of earnings. Is there any change in how investors are valuing the company over time in terms of the P/E ratio? 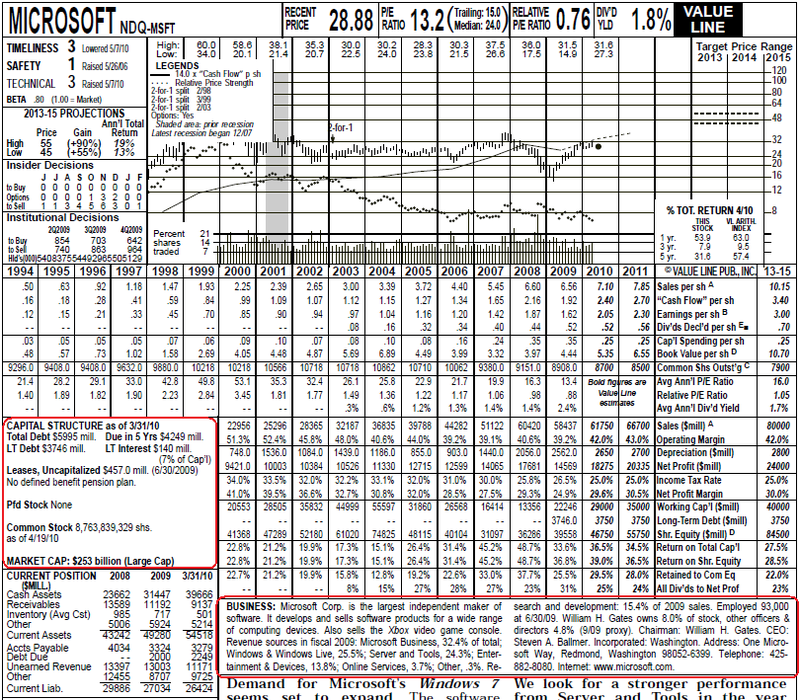 With Microsoft, it is evident that earnings, cash flow, and dividends have been advancing steadily over the past fifteen years while the market has assigned Microsoft a lower P/E ratio over time. We can see that the company does not have to devote significant funds toward capital expenditures. After going through the three steps listed above, most investors will have a good idea of whether the company falls within their circle of competence, whether the capital structure is within their comfort range, and the general economic characteristics of the business. In addition, the investor can look up the current price of the stock and determine whether the company appears to be attractively valued relative to the stock price. 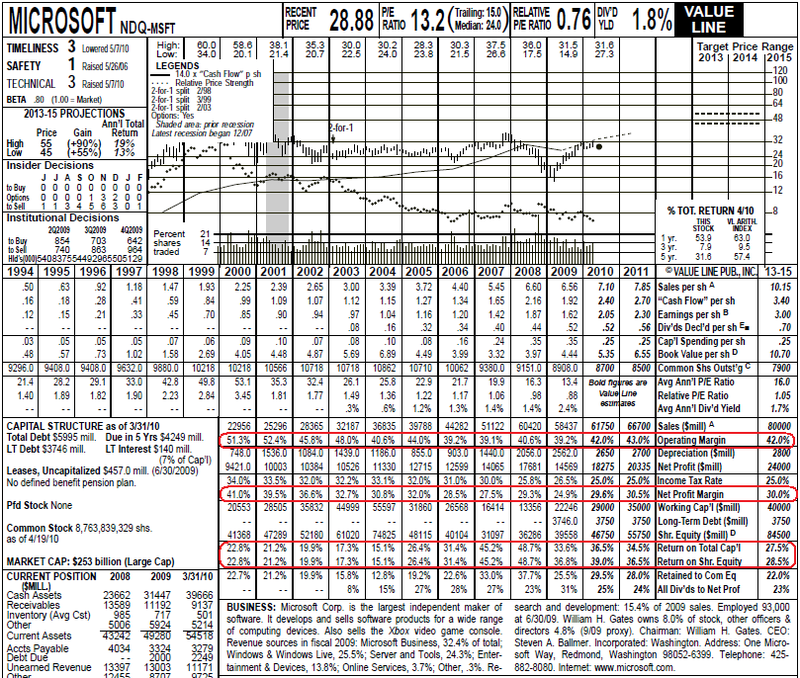 There are obviously many other sections of the report but most are of modest utility to the value investor. As we noted before, the Value Line timeliness ranking system is momentum based. This means that stocks that have displayed positive short term outperformance in recent weeks and months receive a higher timeliness ranking than stocks that have performed poorly. Using the timeliness ranking may work for some investors, but it has nothing to do with fundamental analysis which is where value investors focus. The section of the report where the analyst provides an opinion is sometimes interesting to read, but we must keep in mind that Value Line analysts cover a very large number of companies and their commentary is often influenced by short term considerations. Value Line does attempt to project future stock prices based on earnings estimates and anticipated earnings multiples, but these projections are not generally useful for independent investors who do their own work. In summary, this article provides some guidelines for value investors who wish to use Value Line Investment Survey to quickly review a large number of companies in an efficient manner. In order to do this, it is important to focus on the relevant sections of the report while disregarding technical factors or allowing numerical ranks to influence your judgment. If a company appears worthy of consideration, it is critical to read the 10-K and other financial reports since the Value Line survey is only a brief summary. While there are many other sources of information available online, some of which are entirely free, Value Line packs a very large amount of information into a highly efficient package and this makes it a worthwhile part of the idea sourcing process particularly if you have free online access from your local library.